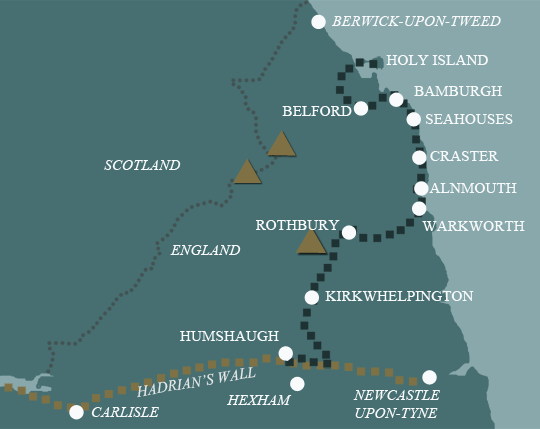 If you’ve only got 4 or 5 days to spare, the coastal section of St Oswald’s Way is not to be missed. After a section inland near Lindisfarne, it follows the stunning, unspoilt Northumberland coastline from Bamburgh to Walkworth. Walking along paths and tracks, over farmland, sand dunes and cliff tops, you will get superb views of imposing castles, spectacular geology, beautiful beaches, and a wealth of bird and animal life. This 4 day holiday provides a good balance between time and distance, giving plenty of time to explore this beautiful section of the Northumberland coast. If the tide is out you can walk all the way to Seahouses along the beach. Otherwise, you get there by following tracks and lanes slightly inland, with views of the Farne Islands and Longstone Lighthouse, from where Grace Darling and her father carried out the famous rescue in 1838. After Seahouses, the route follows some of the most spectacular coastline in Britain. You pass Beadnell, with its tiny harbour and imposing lime kilns, then the magnificent ruins of Dunstanburgh Castle. Just beyond there is the fishing village of Craster, famous for its kippers, then further south again is Alnmouth, boasting one of the oldest golf courses in England. This is a mainly flat coastal walk, and can be completed by people with limited walking experience. Terrain: Flat walking along the edge of the coastal plateau. A small excursion into the low lying Kyloe hills. Coastal paths, and country lanes, beaches, a couple of sea cliffs, and a golf course or two! What’s it like underfoot? On the whole the paths are well defined and maintained, but at times a bit sandy. Walking in soft sand on the beach can get tiring – but there’s usually a parallel path further inland. How Much Up & Down? Not very much at all! Most days are pretty flat. The high point of the route, near St Cuthbert’s Cave, is only just over 200m. You must take note of the safe crossing times and plan your journey accordingly – do not attempt to cross the causeway at any other time as the tides come in very rapidly and the journey across can become very dangerous. 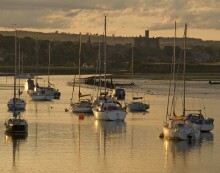 By Public Transport: The most convenient railway station for Warkworth is Alnmouth. Alnmouth station (ALN) is located on the East Coast Main Line with hourly trains between London Kings Cross, Newcastle and Edinburgh. There is no taxi rank at this station. From Alnmouth Station: Arriva Northumbria bus service X18 runs between Alnmouth station and Warkworth hourly (journey time approx. 20 mins). Alternatively, you may wish to make the journey by taxi (journey time approx. 35 mins).We can provide you the number of the local taxi comapny if required. By Road: Warkworth is located just off the A1(T) on the A1068 coast road between Amble and Alnwick and is well signposted. From the North: Follow the A1(T) out of Newcastle towards Berwick-upon-Tweed. After crossing the bridge over the River Coquet, follow signs for B6345 Amble. Once in Amble, turn left onto A1068 to Warkworth. From the South: Follow the A1(T) out of Berwick-upon-Tweed towards Newcastle. Leave the A1(T) at Alnwick to follow the A1068 to Alnmouth then on to Warkworth. Seahouses is known as the Gateway to the Farnes and is well worth a rest day. Famous for its outstanding natural beauty, superb attractions and bustling harbour. Boat trips can be taken to the Farne Islands where you can experience an abundance of wildlife, including entertaining Puffins and lazy seals.